Graupner’s latest offering, the HoTTrigger 1400S V2 Competition Plug-and-Play (PNP), includes many performance and durability upgrades to the original high-performance aerobatic model. 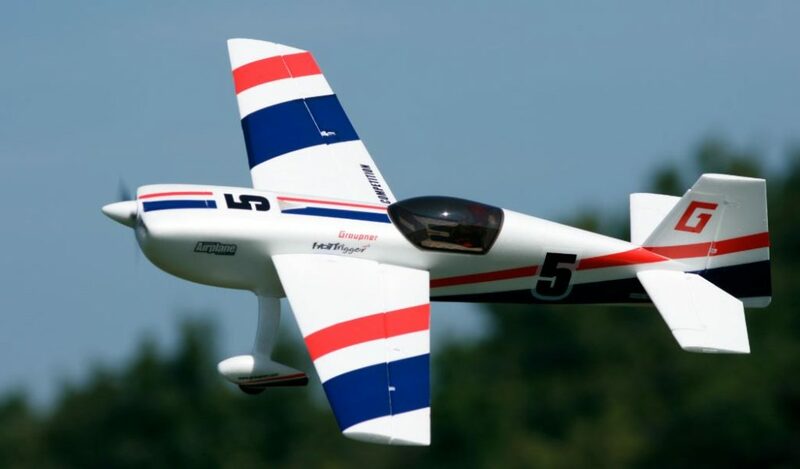 According to Graupner, the HoTTrigger combines the best attributes of the Extra 330SC and Edge 540 designs and incorporates a NACA 63A-mod airfoil for outstanding performance at any speed. 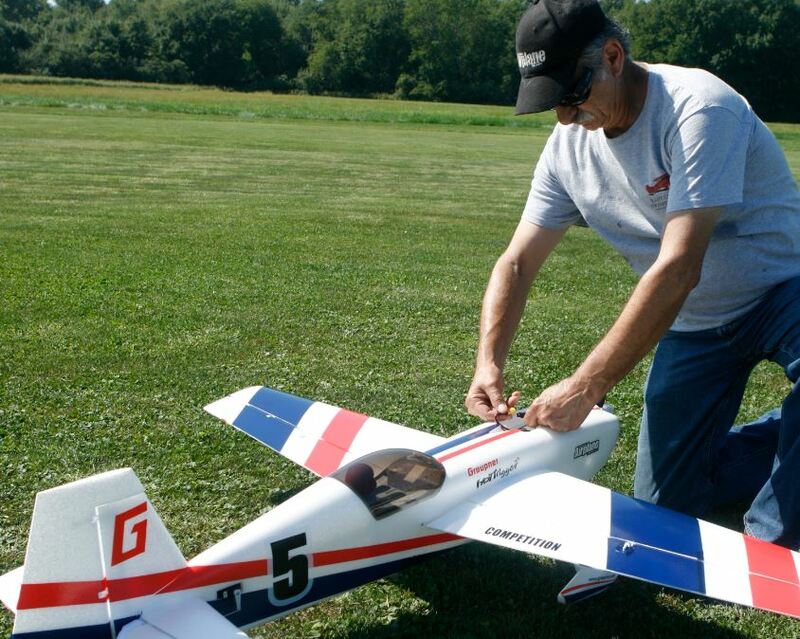 Like its predecessor, it is a PNP model that only requires a receiver and LiPo battery. Field assembly only takes minutes: Slide the spar into the fuselage, insert the wing halves, and press the wing latches into place. No more wing bolts to lose! I felt that the recommended exponential values might result in an overly touchy model (aileron 17%, elevator 15%, and rudder 18% for 3D control throws). I increased these to 55% on all flight surfaces, and this proved to be a good starting point. I believe the recommended values are for use with a Graupner receiver with a flight-stabilization system. The relatively large wheels make taxiing and takeoff easy on grass or pavement. Takeoffs require only a small amount of rudder correction during the short roll. Landings are equally easy: Reduce power, line up with the runway, and flare. When balanced at the recommended center of gravity, the plane felt slightly on the tail-heavy side for my flying style; it had a slight tendency to climb when inverted. A larger-capacity battery should balance the plane to my liking. Stability: Neutral stability, which the HoTTrigger possesses, is the name of the game in aerobatics. The plane retains its stability at all speeds and remains fully controllable at slow speeds. Tracking: From takeoff to landing, the tracking is superb. Knife-edge flight required virtually no corrections, and the plane held a perfect line. Aerobatics: Intermediate and sport pilots will enjoy putting the HoTTrigger through traditional aerobatic maneuvers. Rolls are axial and snaps are crisp, while loops can be as large as you want. There is ample power and control authority for any and all 3D maneuvers as well as extricating oneself from trouble. Vertical performance is fantastic for tall hammerheads or quickly gaining altitude for spinning maneuvers. While some planes excel in 3D but lack precision (and vice versa), the HoTTrigger is well balanced in this respect. Precision maneuvers, such as point rolls, look great, and the plane handles tumbling maneuvers with ease. Glide and stall performance: The HoTTrigger is controllable at very slow speeds without any tendency to drop a wing. Stalls are straight ahead, and recovery is quick. After the first flight of the HoTTrigger, I decided it would be my go-to model for everyday flying. It’s large enough to have a good presence in the air and provide enough inertia to carry the model through aerobatic maneuvers while being easily transported.